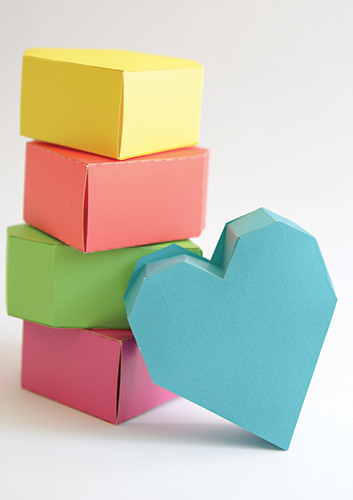 Bring on the love with a set of paper heart boxes. They are perfect for sharing with one special someone or many of the important people in your life! Cut the box and side shapes on desired cardstock using the template as a guide. Score and fold them on the dotted lines as shown onthe template. Adhere sections together on the folded tabs. Leave one of the bottom sections unglued to open and close box. Leave box as is or embellish to match the theme of the party or décor. Create them on your own or enlist the help of little fingers to make it a family project.